The Book Rat: Interview with Betsy Cornwell, author of Mechanica! Interview with Betsy Cornwell, author of Mechanica! I can not believe it is the last day of Fairy Tale Fortnight, you guys, I really cannot. But it is, and we're kicking it off with an interview with Betsy Cornwell, author of Tides, and the upcoming steampunk Cinderella retelling, Mechanica. Check out what she has to say below, and then enter to win a copy of Mechanica for yourself! Welcome, Betsy! What inspired you to write a steampunk version of Cinderella? Way back in the spring of 2009, I was a junior at Smith College in Massachusetts, and I got approval to spend most of my senior year working on a book-length collection of fairy tale retellings. My last semester of college consisted of one poetry class and a weekly meeting with my project advisor (we usually met over sushi), plus a bunch of writing time in the library. It was pretty much my ideal lifestyle (and still is!). At the same time, my best friend was doing some research into steampunk for a set design class. I loved the whole aesthetic, and I'd been having conversations with my advisor about the machinations of fairy tale narratives: the way they're so perfectly, beautifully constructed, but at the same time can be claustrophobic, especially all those very narrow and specific definitions of happily-ever-after. Cinderella seemed to lend itself particularly well to a steampunk retelling: there's already clockwork there, in the all-important midnight clock, and the story itself is one of the most archetypal, tight, and 'perfect' of them all. So Mechanica started as just one short story among a dozen or so in my independent project collection, but with my advisor's encouragement, it quickly grew from there. Mechanica is dedicated to that advisor, Betsey Harries. She believed in my writing career when I wasn't sure if I believed in it myself, and in that sense, she's definitely my fairy godmother. What was the easiest part about writing MECHANICA? The hardest? The easiest part was writing in Nick's voice--she's the narrator and my Cinderella. I don't usually write in first person, and in many ways Nick and I aren't that alike, but I've always felt that I know her well and can hear her voice clearly, if that makes sense. For a long time, the hardest part was admitting that the story had to keep getting longer. As I said above, I'd thought it would just be a short story for a college project, and I felt as if I should move on to other things! But even though it started out at a mere 10 pages and is now exactly 300, I'm still not done. I've intentionally left a few things open-ended, in hopes that I'll be able to write a sequel (or two, or . . . oh dear, I might never be done). You've written about both fairy tale lore and selkie lore now. Will you delve into more types of classic stories in future novels? Oh, yes. I'd love to be primarily a fairy tale reteller in my writing career. I'm just now finishing a companion novel to Tides that focuses on lore about male selkies, and I have plans for a Vaudeville-era "Snow White and Rose Red" and a reimagining of Jane Eyre in the near future, if all goes well! I'm also the story editor at Parabola magazine, and I get to write about fairy tales for them a whole lot, which is great. What are your favorite obscure fairy tales? "The Selkie Bride" has always been one of my favorites, and I think it does count as obscure, even though selkies are getting a little more love these days. I wrote my first novel about them, and there are other wonderful selkie books out there, like The Folk Keeper by Franny Billingsley and Tempest Rising by Nicole Peeler. The film Song of the Sea just came out, of course, and The Secret of Roan Inish and Ondine are both beautiful selkie movies. The web series Caledonia is worth checking out too, and--hmm, I could go on about selkies, but I think that's enough! Find them, read them, watch them. Selkies are great. I've also always loved the old Scottish ballad "Tam Lin." In fact, the first piece of writing I ever published outside of a school magazine was a retelling of Tam Lin called "Shapes." It came out in a lovely online journal called Fickle Muses that only does fairy tale retellings. I was as proud of being in that journal as I was when I got my book deal! If your life was a Disney movie, which would it be...and which character would best represent you? THAT IS SO DIFFICULT. When I was growing up I would have said either Belle or Ariel, given my twin obsessions with books and mermaids. However, the answer that sprang to mind right away for this question is Lilo or Nani from Lilo and Stitch, and I'd say they both represent my personality fairly well, depending on the day. Plus, I just bought a used car (with my Mechanica advance!) and named him Stitch. Which fairytale villain would you never want to reform and why? The first character I thought of isn't generally labelled as a villain at all: Triton, Ariel's father in the Disney version of The Little Mermaid. I grew up with a father prone to rages and verbal abuse, and as an adult, I really can't see Triton as a positive father figure at all. Triton gets no fairy tale brownie points from me! You have to wonder what made him exile Ursula, too. Now that's a villain whose story I'd love to hear . . . Which fairytale mode of transportation would you want to try out? Fairy dust, of the Peter Pan variety. I've had plenty of times when it would have been lovely to fly on the power of happy thoughts! Knight. 'Proven bravery' over 'born to privilege' any day. - Befriend the birds or the mice? Aww, mice. I once had a pet mouse named Kimberly after the Pink Ranger. To celebrate the upcoming release of Mechanica, Betsy has offered up one physical ARC (US) and one e-ARC (INTL) of Mechanica to 2 lucky winners! Betsy Cornwell wrote her first novel, TIDES, as a student at Smith College. After graduating from Smith and getting an MFA from Notre Dame, she moved to Ireland to live with the fairies. 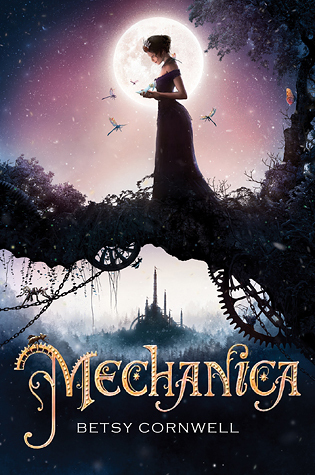 Her second novel, MECHANICA, a steampunk retelling of Cinderella, is coming in August 2015. A companion novel to TIDES, currently called COMPASS, is slated for early 2016. Betsy is also the story editor for Parabola Magazine, and in her free time she wanders around Ireland looking for rose hips and hazelnuts, and also keeps dairy goats. Great interview! I loved hearing more about the conception of Mechanica and Smith College (where I was also a student!). Such an awesome interview! I would love to be a mermaid over a princess any day also! I wanted this book badly enough as it was (seriously, steampunk fairy tale?) but now, knowing Betsy is a fan of the Power Rangers and Stitch? Simply cannot wait to get my hands on it. Thanks so much for the interview! Loved the answer that her favorite villain is Triton! And I'm so looking forward to reading a steampunk Cinderella story. Definitely something I will be picking up! I love the concept of the heroine being, basically, an engineer. Not an archer, martial artist, angry teen, etc. but an analytical, mechanically-minded woman. LOVE. I love fairy tale retellings and steampunk! I totally agree that there is so much more to Ursula than her perceived villainy, and that Triton's involvement in her banishment was likely for purely selfish reasons! I can't wait to read this book because it combines steampunk and fairytales, two of my favourite genres! I love all things Cinderella, and this book sounds wonderful! Oy, and that cover?! So pretty! STEAMPUNK CINDERELLA?! Oh my. I must have this book. And the cover is to die for. This cover is seriously beautiful! I am really curious about a Steampunk Cinderella. But I am also curious about the "Selkie Bride." I have never heard of that fairy tale before! Where can I find it? I love Steampunk fairy tale retellings! I so agree with these This or That answers, except I would go with birds, definitely birds. Great interview and I love the cover!!! I have been wanting to read because I love fairy tale retellings and steampunk!